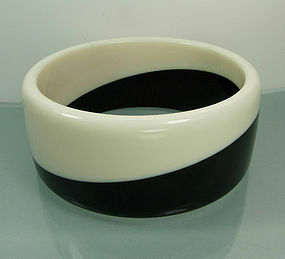 Chic and mod vintage bangle in seamless laminated off white Lucite and black Bakelite (the Bakelite tests positive with Simichrome). Circa 1970. From the estate of a New York socialite. 1 1/4 inches wide and 1/8 inch thick, and standard 2 1/2 inches inside diameter. Excellent condition. Photos enlarged to show detail. Display form is life size.